I don't often call pizzas beautiful, but I think this one should be described with that word! The vibrant colors and flavors are indeed beautiful. In the summer, I love adding a few slices of fresh tomato to this. (If you come across any delicious tomatoes now, I say go for it!) Either way, this pizza is a delightful choice for breakfast, lunch or dinner. I plan to serve it at our Mother's Day brunch. What a pretty centerpiece it will make! Bake your pizza crust before you do anything else. This is a pizza served at room temperature, and the crust should be cooled completely before you begin to add the toppings. In a small mixing bowl, use a teaspoon to mix the creme fraiche with the capers and lemon juice. Once your crust has cooled to room temperature, spread an even layer of the creme fraiche mixture to cover the entire top of the crust. 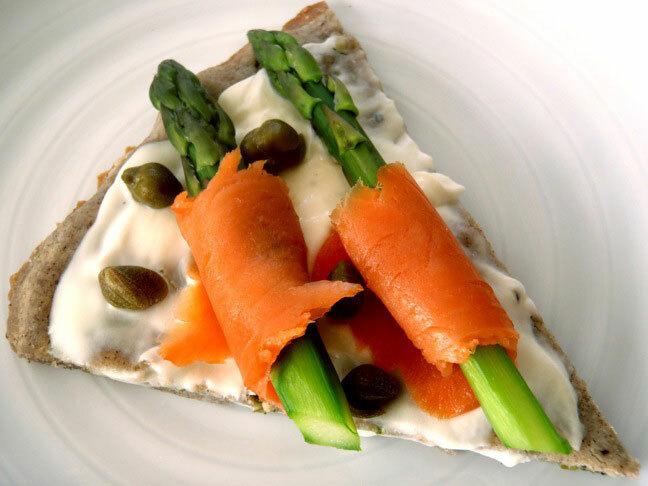 Then spread the salmon slices on top, followed by the asparagus.